Time to pick the horse’s hoof out? Why not throw in a forward bend. That makes 4 forward bends if you do it for each hoof! How about brushing the legs? Why not side lung to the front, then to the back. That’s 2 of each when you go to each side of the horse. Girth’s all done up? Now time to stretch the horse’s legs forward. It’s a stretch in addition to smoothing the skin under the girth area! Want to give you horse a treat? Make him stretch his head to each side to reach it, or down to his chest or between his front legs. This also helps to prevent or deter bad manners. The horse learns that he will be asked to do something for his treat. He doesn’t’t get the treat directly from pocket. I even figured out how to teach my horse to bow. Now when I pull a treat out he starts to bow in excitement for it! Yoga with horses was starting to come together. One day I decided I’d try to shoot pictures of some of the poses I knew my horse and I could do well together. I wanted to give a special momento to my yoga studio as a going away present because I would be moving away soon. I set up the camera and had a friend help. We got two fabulous shots in about 10 minutes. It really made yoga with horses come to life. Friends and friends of friends wanted to know more. They wanted to do yoga with horses. This is where I can’t thank Linda-Ann Bowling enough. 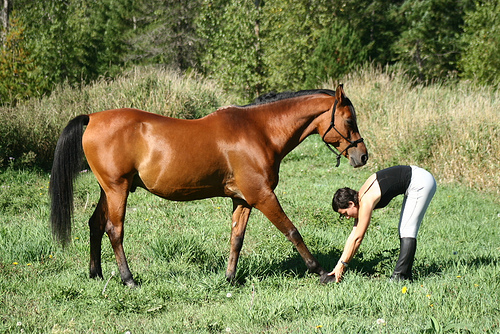 It was her support and program that made it possible and inspired me to take yoga with horses to the next level. Hi! My name is Linda Guanti. I believe that yoga is for everyone and that even a little can make a big difference. In my early teens a serious injury left me with chronic health issues and most importantly affected my horse’s life. When I discovered yoga it was life changing. I immediately recognized how well it connected with riding and a horsey lifestyle. Yoga helps us stay physically healthy and able to be with and enjoy horses. I soon began to understand the equal importance of having your horse be flexible and stretched. So I learned how to help my horse stretch too. Combining yoga and my life with horses seems natural and has proven successful in keeping both myself and my horse healthy and happy.